That’s why we love science. It’s more than a school subject, or the periodic table, or the properties of waves. It is an approach to the world, a critical way to understand and explore and engage with the world, and then have the capacity to change that world, and to share this accumulated knowledge. It’s a mindset that says we that can use reason and logic and honest inquiry to reach new conclusions and solve big problems. Amherst Students are very interested in STEM. Science courses (specifically introductory ones) make up some of the largest classes within the College as a whole. To use chemistry as a case study: 5/9 courses within the Chemistry major overlap with the pre-medical requirements needed to apply to US medical schools. As a result, approximately a quarter of the incoming first year class (~115 students) enrolls in Introductory Chemistry each fall. In the Fall of 2015, the Chemistry Department offered the first and second most enrolled courses at the College. In the STEM classroom, many of these students are underrepresented. Data (collected from the Integrated Postsecondary Education System) represents Fall 2014 enrollment in Math, Biology and Mathematics. Data on Chemistry majors was not available for use. Within the Amherst classroom or lecture hall, minority STEM students often struggle to find peers with common identities to their own. Fall 2014 enrollment data demonstrates that there are a disproportionately small number of Black, Asian, Latinx and Multiethnic students when compared to their white peers. International students are similarly underrepresented, making up anywhere from 9-23% of a given STEM major. This problem only worsens as students progress through the curriculum; in particular, attrition amongst students of color is quite common within upper-level STEM courses. This is compounded by a dearth of faculty role models. Though studies have shown that STEM students benefit immensely from same-race professors, the diversity of the Amherst College faculty is not representative of the student body that it teaches and advises. 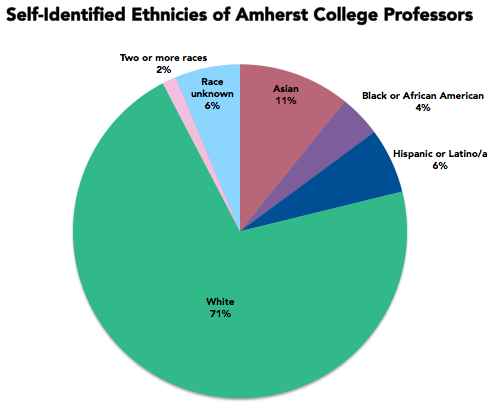 71% of the tenured faculty at Amherst self-identify as White – a group larger than the number of Asian, Black and Hispanic professors combined. While specific data on STEM faculty was not available for study, it is not difficult to speculate how these college-wide patterns might also hold within science departments on campus. These issues exist nationwide, but they are especially prevalent at Amherst. "Amherst College...has made a huge commitment to recruiting talented students from all backgrounds, regardless of their ability to pay tuition. Today, nonwhite students outnumber white students on Amherst's central Massachusetts campus, and 23 percent of students qualify for federal Pell Grants." It is important to note that the issues discussed on this page are not unique to our school or campus. There is widespread research demonstrating that minorities in STEM (whether underrepresented in terms of race, gender, sexuality or another facet of identity) face obstacles that are absent for many of their privileged colleagues, professor or peers. However, these issues are particularly central to Amherst College, an institution that has prioritized the diversity of its student body above all else. As such, conversations around race, inclusion, and academic opportunity take on a different level of urgency and importance. Amherst has implemented some programs to help its students. Increase the numbers from underrepresented groups in the sciences by both retention and recruiting. Students that participated in Summer Science were more likely to major in STEM areas; in the years since the program's development, there has been an increase in Summer Science STEM majors from 10% to over 30%. ﻿1978: Thomas Wattley, Jr. ‘75 submits a Proposal for Supporting Services to Dean of Students David Drinkwater. This was the first document to “recommend a more comprehensive academic support program” at Amherst to ensure that all students develop the reading and writing skills necessary to benefit fully from an Amherst education (A Promise to Keep, 1995). 1978-1983: Nearly all recommendations from Wattley’s Proposal are adopted. Including Writing Counselor involvement in freshman orientation programming and upgrading the Writing Counselor position to full-time. 1983: A subcommittee of the Committee of Six met for the first time to explore academic resources at Amherst and peer institutions. 1983: Math 105/106 offered for the first time. These courses split introductory calculus into two semesters to allow students with weaker math preparation to review material at a more manageable pace. 1987: Summer Science Program founded. The Summer Science Program targeted incoming first-year students with weaker high school math and science preparation to introduce them to the complex problem solving skills necessary in STEM courses and to the resources available at Amherst. In its early years, the program included Chemistry and Biology and was taught by instructors from outside the college. 1991: Admission to Amherst: A Report to the Faculty. While not focused on academic resources, this report from the Admissions Committee represented a shift in Admissions and underscored the importance of recruiting students from underrepresented groups who showed great intellectual promise. The committee was tasked with discussing the extent to which additional assistance should be given to students from weaker programs. 1992: Charles Drew Health Professions Society founded. Originally the Charles Drew Pre-Medical Society, this group was established to provide support for minority students interested in health professions. It has since grown to welcome all students interested in joining. 1992: The Department of Mathematics joins the Summer Science Program. 1992: The Summer Science Program becomes fully staffed by Amherst College faculty. 1995: A Promise to Keep published. The Committee on Academic Support’s final report examined the effectiveness of academic resources given the changing demographics of the college, finding that many promising students cannot fully benefit from Amherst’s curriculum due to their high school preparation. Their recommendations included the establishment of a Quantitative Skills Center and full credit “transition” courses in science and math for first-year students with weaker background preparation. 1997: Moss Quantitative Center founded. Following a campus wide movement to promote the creation of a Quantitative Skills Center. The Q Center provides drop-in and by appointment tutoring in the sciences, math, statistics, and economics. 2001: Full-time Q-Center Director appointed, replacing alumnus ‘Green Dean’. 2001: Phoenix Program launched for Chem 151. The Phoenix Program provides the opportunity for students earning below a B- in Fall Chem 151 to review and master the material and retake exams during interterm, improving their understanding and raising their grade up to a B-. 2002: Report of the Special Committee on Amherst Education. In examining the existing practices of Amherst in comparison to peer institutions, the SCAE reported that, while Amherst stood out in the freedom given to students in pursuing their interests, Amherst provided relatively little support to its most underprepared students, effectively closing off portions of the supposedly open curriculum. Within the committee's proposal, it suggested the creation of quantitative requisite for certain introductory courses, a diagnostic test for all incoming students to assess quantitative skills, a quantitative skills course to remedy deficits, and a summer term science program to ensure all students can complete their courses within four years. Fall 2005: Intensive Chem 151, Math 111, and Econ 111 sections introduced. Intensive sections offer additional small-group, problem-based course meetings to complement lectures. Courses that offer intensive sections now include Chem 161, 221, and 231, while the Econ 111 intensive section has been discontinued. 2006: Amherst Peer Mentor Program launched. 2006: Committee on Academic Priorities Report. The first of two Chemistry Academic Managers was hired to support underrepresented chemistry students by staffing intensive sections and the Phoenix Program, as well as teaching in the Summer Science Program. Fall 2007: Biol/Chem 131 offered for the first time. Biology/Chemistry 131 was designed as an entry point for students interested in science courses but for whom, due to weaker science and math preparation, "CHEM-151 would be an unwise choice and a discouraging experience." By including small group work and an intensive lab sequence, the course aimed to prepare students for the rigor of subsequent chemistry and biology courses. Last offered Fall 2013. 2008: Post-Baccalaureate Course Work Option created. Initiated by President Marx, this program gives up to three students the opportunity to complete required pre-med science courses during the semester or year following graduation at no charge, allowing students to spread out lab courses and take them at a pace that ensures their success. 2008: Amherst Report to the New England Association of Schools and Colleges Commission of Institutes of Higher Education. This report was the result of three semesters of self-assessment of how well Amherst was fulfilling its mission to serve a diverse body of students, including the identification of successes and weaknesses in the resources offered and a list of projections for the near future. Perhaps most relevant to STEM, the report acknowledged that Amherst did not offer sufficient support to less well-prepared students for them to flourish within the open curriculum. 2011: Organic Chemistry Academic Manager hired. A second Chemistry Academic Manager was hired to staff intensive sections of organic chemistry. 2011: Full-time Health Professions Advisor appointed. The Health Professions Advisor mentors pre-health students from before their arrival on campus through their applications to medical school. In addition to offering extensive advising, the Advisor has also extended Amherst's professional contacts, arranged panel discussions and visits from medical school admissions representatives, and supported student pre-health groups such as the Charles Drew Health Professions Society and GlobeMed. As part of her White House Initiative, President Martin pledged to increase the proportion of low-income and disadvantaged students in STEM fields a Amherst and close gaps between these students and the student body as a whole. Pairing upper-level statistics students to those in introductory courses for mentorship. The Fellows also offer workshops and drop-in tutoring hours. A relatively new resource on campus, the Amherst chapter of the national Association of Women in Science aims to support Amherst women interested in a career in STEM fields, which it accomplishes through guest lectures, alumni panels, workshops, weekly study groups, and networking events. 2014: Amherst Women in Computer Science club founded. The Women in Computer Science club focuses on building community between and support for women in tech at Amherst. In addition to weekly lunches, the club offers workshops on topics such as Imposter Syndrome and organizes trips to conferences. 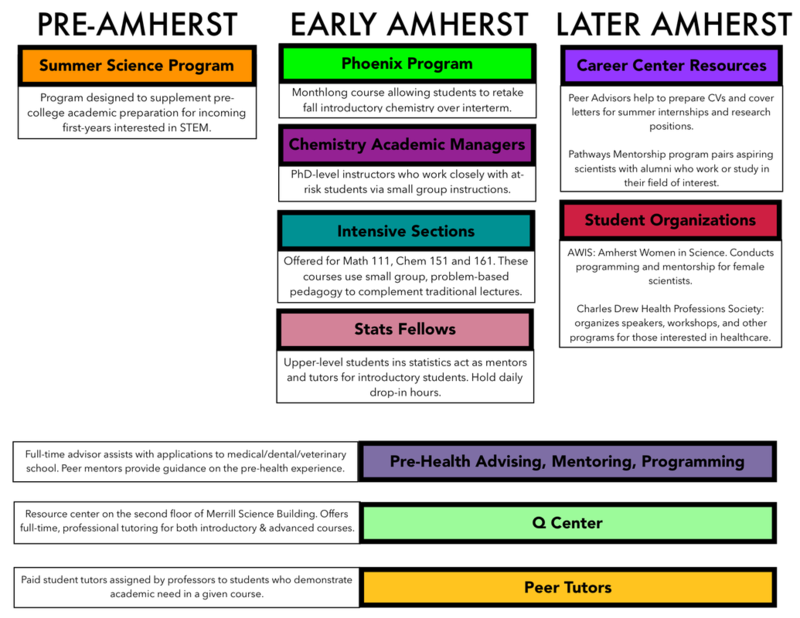 Below is a rough overview of resources available as students navigate their path through STEM at Amherst. As our project is carried forward beyond this semester, we hope to collect more comprehensive information on college-wide STEM support initiatives and activities, and work with STEM departments, the Quantitative Center, the Career Center, and STEM-related student organizations to keep information on resources current and easy to navigate by students at any stage of the STEM pathway at Amherst. "We, as a Department, are strongly committed to fostering an environment where students from underrepresented groups are supported, feel nourished and respected, and can thrive and succeed. We stand with you against bias and prejudice, and we hope that an open dialog on these issues will lead to a more inclusive community. " "Both the College and its departments must do a better job of ensuring that students of every race and background have the support needed to thrive academically and to have full access to the opportunities here. Computer science is a field in which students of color are underrepresented, both here and nationally. This is a great loss, because our field needs all the talent that it can find. As a department, we will renew our efforts to provide an environment that welcomes and enables the success of all students." " We are deeply concerned about the prejudice and bias that many of our students face, and how challenging this has made their experience at Amherst. The Biology faculty reject any form of discrimination. We are strongly committed to fostering an environment where all students feel supported. We realize that there is much learning and work to be done, but we look forward to a meaningful dialogue with our students, with a goal of ensuring our Department is a welcoming place for everyone. " No department-wide initiatives for underrepresented groups, but individual faculty members prioritize encouraging them. "Although Amherst has taken noteworthy steps to create a diverse student body representative of our global society, we recognize that more work needs to be done to ensure that all groups receive equal care and opportunity, both in and out of the classroom...Our hope is that through open dialogue, collaborative efforts, and understanding, Amherst College will transform into a community where people of all backgrounds can feel welcome and thrive"
Because Biochemistry and Biophysics (BCBP) is an interdisciplinary discipline, its faculty are often cross-listed in two departments. As such, the department has very few resources (financial or otherwise) devoted to BCBP students. Ensure that financial aid grants do not decrease for students who receive geology scholarships.